Candy Corn, Fresh and In-Season Now! Fall marks the beginning of the candy holiday season. I know it is upon us when the bags of candy corn appear in stores. There are several varieties, my favorite being the three-color ones. Brach’s makes a decent version. According to the folks at Wikipedia, 20 million pounds of kernels are consumed each year. As with most candies, people either like this stuff, or hate it. Honestly, I can only eat a few since it is so sweet. This also makes for great craft and decorating projects. You can even make a wreath out of the stuff. 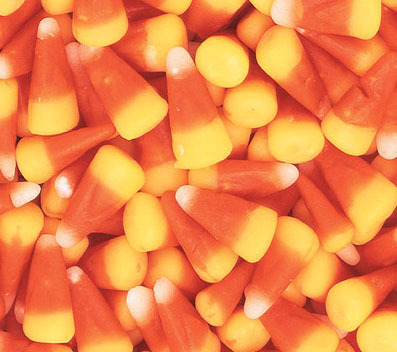 Traditionally, candy corn was made for Halloween and Thanksgiving. There are now versions for Christmas, Valentine’s Day and Easter. I am a traditionalist and only eat it in season, so now’s the prime time. Since you love Candy Corn, I’m sure you’ve tried the mix of Candy Corn with Dry Roasted Peanuts, you mix it all together and when you eat a handful it taste like a “PayDay”…I’d have a big container with this mix on my desk at the office and everyone always loves it!!!! actually, I have missed that mix, I’ll try it this fall. thanks!